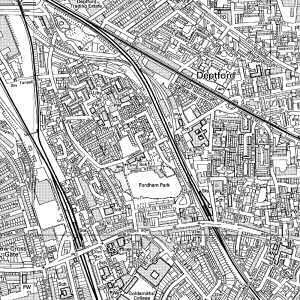 This area used to be known as Hatcham, an Anglo-Saxon name, meaning “Hacci’s village”, or possibly “the village in the clearing in the woods”. A map of 1619 shows the area as still heavily wooded. The main road from London to Canterbury and Dover runs through the area, and from the early 18th century travellers using it had to pay tolls at the New Cross turnpike gate at the top of what is now Clifton Rise. This gate took its name from a nearby inn, the Golden Cross. 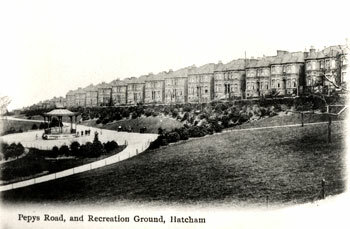 Gradually this area on the Kent and Surrey border became known as New Cross, while the old settlement to the west (in Surrey) continued to be called Hatcham. It was when the toll gate was moved in 1813 to the junction of New Cross Road and Peckham Lane (now Queen's Road) that the name New Cross began to spread to the whole district. In 1614 most of the land here was bought by the Haberdashers Company as an investment for a charity it administered. A number of fine country houses were built on the estate in the eighteenth century and let on long leases to City men, often Haberdashers. From the 1840s the Company began to build substantial villas on this land and in 1873 founded a boys’ and a girls’ grammar school here, using money from the charity founded by Robert Aske. The first railway had already arrived in 1839 and most of the houses in this area were originally occupied by middle class inhabitants, many of them working in central London. Now many houses have been converted into flats, often occupied by students at Goldsmiths College. There were also industries in New Cross, in particular the Hatcham Iron Works where George England manufactured railway locomotives from the 1840s to the 1860s, and the depot and repair shops of the London and Croydon Railway were at New Cross Gate station.